Oh, that would put me off of even Thinking of sitting in Santa's lap. It looks like "Elf on the Shelf" meets Freddie Kreuger. lol...wow, that is major creepy. The the bare tree reflection in the window adds to the creepy. When I first saw that I was like monster! Then I looked again and it was Santa. That is the most creepy looking Santa EVER! Oh wow! Yes, definitely creepy. Yeah, that is kind of creepy. At first I thought it was an elf! HA! He's creepy but I like him! Is he bald? The reflection of the tree on the glass adds to the creepy feeling. My WW is kitchen remodeling and thick snow. Happy wordless Wednesday! Yeah, totally creepy. Doesn't say Christmas at all to me. Creepy indeed. Thanks for my nightmare tonight. Are you sure that is Santa?!? I don't believe it. You're right about it being creepy. I half thought it was an snow owl. When I first saw it I thought it was an owl. Duh! I'm not sure what I'm looking at. 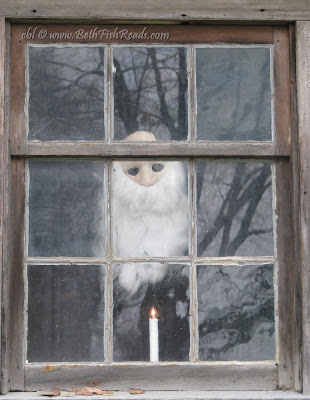 I also thought it was an owl, then a doll with a white dress, and then I read you title of a santa. Mmm - interesting.